← What Does Being Glutenated Mean? Here are some of my new products from RED APPLE LIPSTICK. That lipstick shade is “Flirt with Me” and its a great neutral. I got an “almost red” liner, and a “blush” as well. All Gluten/Paraben FREE! My friends will tell you, I’m a freak about make-up… and hair spray. While most people can just get up and run to the store carefree… I must have my make-up on/hair done. Some might call that…. vanity. Truly. I do look sick. About my hair? I think I just had enough bad hair days in the 80s and 90s to last a lifetime… I’d rather live in a dream that my naturally, curly, out-of-control-mop (or as my husband says SASSY hair) – is the one thing I can try to tame on a daily basis. I still giggle when my hair is “natural” and people ask me if I paid money to make my hair look like that…. (hah!) Not a chance. So, what does this have to do with health? Good question. It goes back to the hairspray debacle I had back in April…when I realized that beauty products I was using, ALSO had gluten in them. Conflicting reports I read said I wasn’t EATING the products, so it shouldn’t be a problem… unless you have dermatitis issues. BUT… the other side of the coin said – it IS an issue, and you ARE putting it in or ON the largest organ of your body – your skin, which absorbs those toxins and will cause an effect. Well, if you use hair spray like *I* do… then you’re bound to ingest it… which would explain why I felt so poorly after getting ready in the mornings. If gluten was in my shampoo, and conditioner, and my hairspray… and my eyeliner, and my lipstick… and it was. THAT was NOT working in my favor. Changing food was one thing, but changing my daily beauty therapy? Yes, I’ve been in the process of doing that too. Hair spray and shampoos/conditioners were first… but I’ll admit – they’re tricky! Sometimes Wheat Protein is labeled as such, and sometimes – it’s NOT. If you have a question, check out the national celiac message boards for tips or call the specific company yourself. Here is a link to the skinny on gluten-free hairspray by the Celiac Diva. She’s SO helpful! 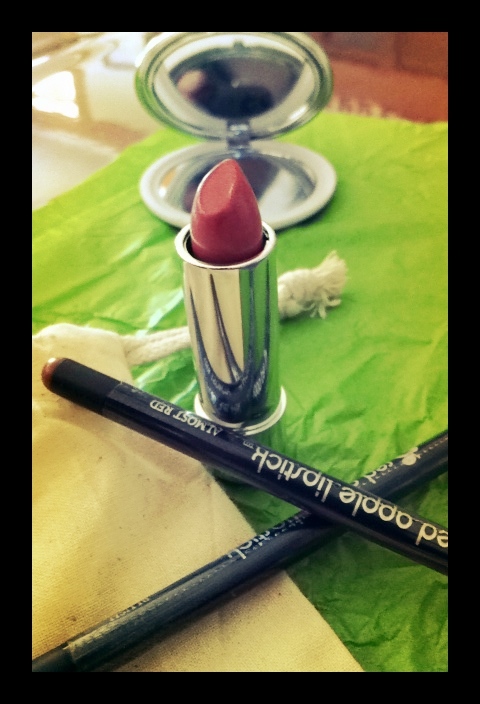 Posted on July 9, 2012, in Celiac/Gluten Sensitivity, Change, Our Struggles and tagged celiac disease, gluten free beauty products, gluten free lipstick, gluten sensitivity, Red Apple Lipstick. Bookmark the permalink. 1 Comment. Having known you a few years, this post makes me smile. So glad you’ve found some products that work for you!